Twenty-four years ago detectors in the US, Japan and Russia observed a burst of 24 neutrinos which originated from a supernova in the Large Magellanic Cloud. About 2 hours later, an experienced New Zealand amateur astronomer observed the area of the supernova, but noted nothing unusual. About 3 hours after the neutrino burst however, the first visible sign of a supernova was captured on a photograph taken at a telescope in Australia. 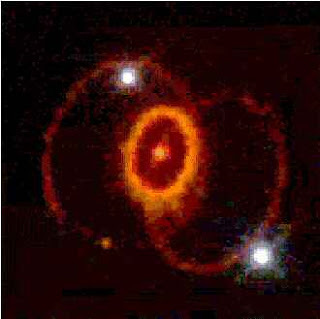 It is known as Supernova 1987A. What was then seen as curious is that the neutrinos arrived two to three hours earlier than the light from the star. Did this mean that the neutrinos had travelled faster than light? No: it simply meant that the neutrinos had a head start. The core of a massive star has enough gravity to squeeze the matter in it so tightly that protons and electrons combine to form neutrons. This transformation also produces an enormous number of neutrinos. The neutrinos are able to pass through the star’s outer layers and escape into space before the star shows any outward sign of trouble. As far back as 1987, astronomers predicted that neutrinos from a supernova would arrive before its light. Could this be why neutrinos appeared to travel faster than the speed of light in the earthbound experiment at CERN? If so, Einstein can rest in a steady state.